Chris Walker (of EvangelismCoach.org) and I are teaming up to present a webinar on Thursday, March 10, 2011 at 1:00 PM titled Social Media for Pastors and Church Planters. 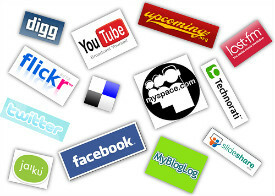 How to decide which social media sites are right for you and your church. How to avoid social media faux pas that can drive people away from your church. How to use social media to get better search rankings in Google. How to use both a Facebook page and Facebook profile together for maximum effectiveness. There will be time for Q&A at the end of the webinar, but what questions would you like to see addressed in the webinar? Edit 3/11/11: Thanks to all who participated in the webinar! If you missed it or want to review, you check out the video, slides, and resources from the Social Media for Pastors and Church Planters Webinar. would love your recommendations about growing @Pray4Tunisia on Twitter and Facebook. I love to get aquainted with your progarm, and share with you bout my ministry. Especialy in growing. 1.Participation is important, it's for empowering and encouraging those in any ministry.2. Your ministry can win a soul to Jesus.Thats helping a church or a ministry to grow. So if you can advertise my ministry to your site or church, because i love to have others in the music ministry come and share with us or participate in this outreach program in March 26 2011. To Empower and To be Empowered is GROWING. How do you keep personal (family, etc.) and ministry accounts & updates separate or should you? Thanks for sharing this, Paul. I'll be there! Thanks for opening it up! Here's a challenge for you outside of the tools: How do you mobilize the church tribe? Perhaps a 3-point plan? How do you get the ones on social media untied and herd the cats who aren't? The tools are great if we can unite the people. I hope this isn't way outside of the tools. It's a challenge. Toni, glad to hear you'll be a part of the webinar. That's a great question! A lot of pastors/churches start using social media and find they are a "lone voice crying out in the wilderness," a string of tweets/posts with no responses from anyone. The tools themselves can't create a community or mobilize it, it's all all about how the tools are used. Paul.. I want to view but will not be able to at the scheduled time will it be made available to view later that day? Yes, barring any technology mishaps we'll have a recording of the webinar posted online sometime later. Thanks Paul.. how would I keep up with that info.. sorry where would I find the link when it is posted. I apoligize but I would like to view this as I feel it is important information. I do a blog post about it here. You could also register for the webinar even though you won't be there. An email will go out to everyone registered afterwards with links to notes, slides, video, etc. Looking forward to this. One question I have would be: "How do you connect with people in your community on facebook and twitter without coming across as a spammer or stalker?" I'm interested in some tips about how to decentralize the use of social media among the staff. No one person can represent "the church" and people won't engage with the guy behind the curtain – they want to talk with a real person. How can I encourage our ministry leaders and pastors to begin? Awesome question, Debi! This is going to be one jam-packed webinar. We may have to do more than to cover all these great questions. Can we come even if we're not a pastor or church planter? Appears that you're supposed to be one or other but I'm still interested in coming if I'm allowed to. Certainly, Becky! Everyone is welcome. It will be geared towards church planters, but anyone interested or involved with social media for churches will benefit from this webinar. wow… interesting. that account shouldn't exist. what would be the Philippine time of the webinar? Loved the webinar, hate the junkmail I'm now getting at the email address I used to sign up for it. Bummer. Really, who's it coming from? Lots of random things, no one particular company. Luckily it's all being redirected to my spam filter, but still a bit of a pain. I like Your Article about Webinar: Social Media for Pastors and Church Planters | Christian Web Trends Blog Perfect just what I was looking for! . I like Your Article about Webinar: Social Media for Pastors and Church Planters | Christian Web Trends Blog Perfect just what I was searching for! . Great goods from you, man. Webinar: Social Media for Pastors and Church Planters | Christian Web Trends Blog I’ve understand your stuff previous to and you’re just extremely excellent. I really like what you have acquired here, certainly like what you’re saying and the way in which you say it. You make it entertaining and you still take care of to keep it wise. I can not wait to read far more from you. This is actually a tremendous Webinar: Social Media for Pastors and Church Planters | Christian Web Trends Blog informations. Regards for sharing Webinar: Social Media for Pastors and Church Planters | Christian Web Trends Blog with us keep update bro love your article about Webinar: Social Media for Pastors and Church Planters | Christian Web Trends Blog . Thanks for sharing Webinar: Social Media for Pastors and Church Planters | Christian Web Trends Blog with us keep update bro love your article about Webinar: Social Media for Pastors and Church Planters | Christian Web Trends Blog . Magnificent goods from you, man. Webinar: Social Media for Pastors and Church Planters | Christian Web Trends Blog I have understand your stuff previous to and you’re just extremely wonderful. I really like what you’ve acquired here, really like what you are stating and the way in which you say it. You make it enjoyable and you still care for to keep it sensible. I cant wait to read much more from you. This is really a wonderful Webinar: Social Media for Pastors and Church Planters | Christian Web Trends Blog informations. Hey There. I found your blog using msn. This is an extremely well written article. I’ll be sure to bookmark it and return to read more of Webinar: Social Media for Pastors and Church Planters | Christian Web Trends Blog . Thanks for the post. I’ll certainly return.